The new IKEA store in Greenwich opened its doors on 7 February to much fanfare about its green credentials. It has certainly delivered in terms of its green roof provision, with a 4,000m2 green roof installed by Bridgman & Bridgman gracing the roof of the store. 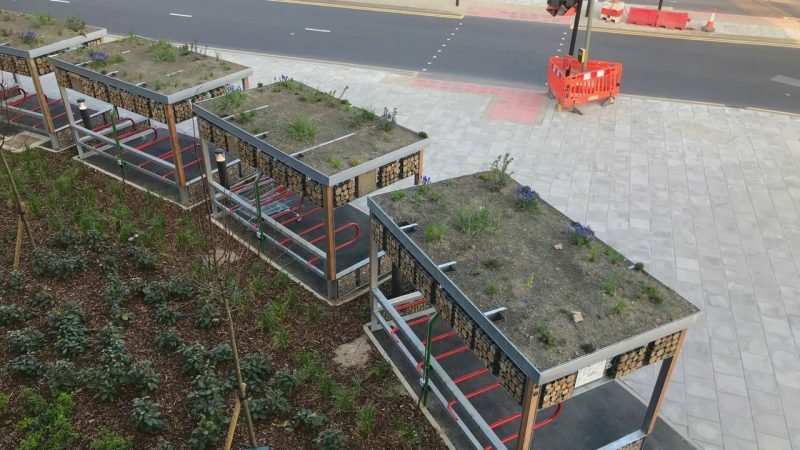 However, small green roofs are just as important as large ones and, complementing the main green roof at IKEA, there are also seven cycle shelters, each with its own green roof which together add up to an additional 60m2 of green space. Visible at street level, these cycle shelters provide not only pocket habitats for wildlife, but an attractive and welcome splash of colour as the carefully selected flowers gradually come into bloom. The cycle shelters were designed and installed by Green Roof Shelters, which was founded in 2008 (See The innovator, The Guardian). Over the past 10 years, the company has finessed the design of these unique green roof units, its primary aim being to deliver biodiversity. The soil on these shelters has a greater depth than is usually the case with extensive green roofs. This allows for a greater range of wildflowers, which in turn attract a greater range of insects and pollinators. The shelters at IKEA were only installed in February, but already the spring bulbs are in bloom, including Muscari bulbs. These are attractive to a number of early solitary bee species, including Hairy-footed flower bees Anthophora plumipes. As spring turns to summer, native wildflowers such as Lady’s bedstraw and Birdsfoot trefoil will come into bloom attracting other solitary bees, moths and butterflies. It is hoped that the Viper’s bugloss mason bee Hoplitis adunca, which was discovered close by, will also be found foraging on the roofs. Perhaps it will also nest in the unique habitat features on the shelters. The shelters come with a variety of other features designed to encourage wildlife. Drilled wood panels allow solitary bees to take up residence. There are stone filled gabion baskets that provide shelter for invertebrates as well as bird boxes. Such features are unique to Green Roof Shelters’s units. The company builds and grows its green roofs off-site in rural Essex. Off-site construction is perfect as it allows the plants to become established prior to transportation. Green Roof Shelters’s units grace housing estates, health and community centres across the UK, from Newport to Glasgow. The team has a track record of delivering unique products and landscapes and has picked up numerous awards over the years, last year winning the Biodiversity Challenge Innovation at the BIG awards. The team comprises John Little, Dan Monck, Duncan Kramer and Dusty Gedge, In 2007, Dan and Duncan established the Frontyard Company and created Plantlock, an attractive solid planter functioning as an immovable object to which bikes can be locked. In 2009, Dan and Duncan joined forces with John Little of the Grass Roof Company and Dusty Gedge of Livingroofs,org, both with over 25 years of building and designing green roofs. John and Dusty also wrote The DIY Guide to Green & Living Roofs, an online guide to building small-scale green roofs. IKEA is the first major retailer to install the company’s cycle shelters. Hopefully, more will follow its example.